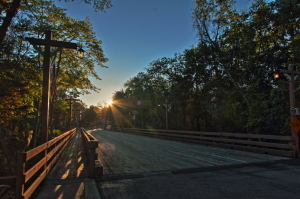 Bear Creek – a Blair Group property located in Central Florida near the Atlantic Ocean – is a 98-acre manufactured home community where the beauty of the homes is rivaled only by the grandeur of the natural wooded surroundings. Inside of our manned security gate you’ll find a wealth of excellent amenities and fun social activities to participate in as a resident. Bear Creek has three spacious clubhouses, each with its own pool, kitchen, and other amenities that our residents and their guests are freely able to use and enjoy. Our flagship clubhouse, Clubhouse 2, is a hub of activity; in addition to having a pool, fitness center, and kitchen, Clubhouse 2 features tennis and pickleball courts, shuffleboard courts, billiards tables, ping pong tables, a spacious dance floor, and a fully stocked video library. If you’d like more information about Bear Creek and why it’s such an incredible manufactured home community for active, nature-loving retirees, please contact us today. A member of our team will be pleased to speak with you about your retirement lifestyle goals and housing needs.